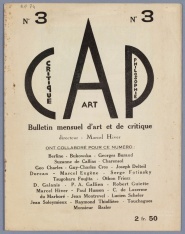 CAP: Critique Art Philosophie: bulletin mensuel d'art et de littérature was a magazine edited by Marcel Hiver and published in 9 numbers in Paris between 1924 and 1928. CAP 1 (Apr 1924). Download (44 mb). 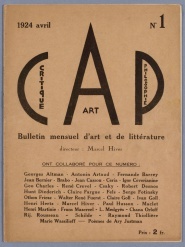 CAP 2 (May-Jun 1924). Download (63 mb). 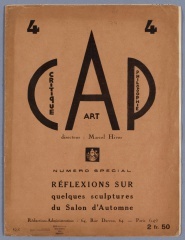 CAP 3 (Aug-Sep 1924). Download (47 mb). 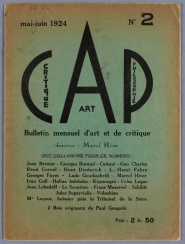 CAP 4 (Nov-Dec 1924). Download (50 mb). 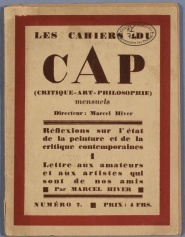 CAP 6 (1927). Download (48 mb). 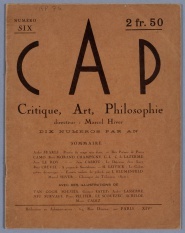 CAP 7 (Apr 1927). Download (47 mb). This page was last modified on 9 September 2014, at 23:42.